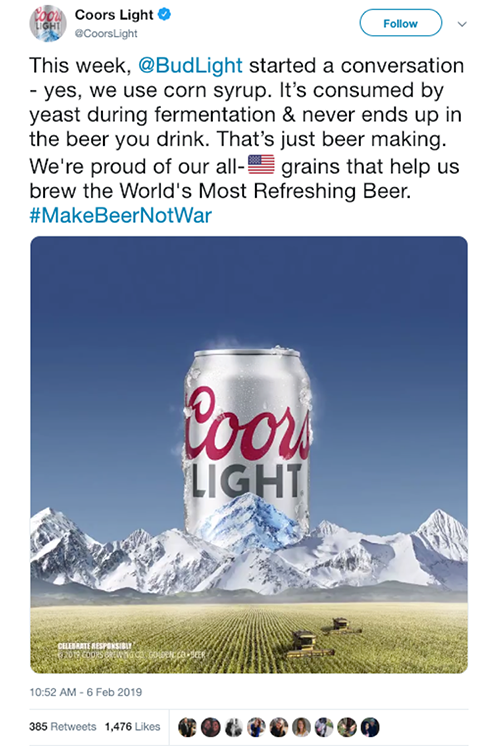 You aired an ad campaign around the notion that corn syrup is not used in your brewing process and thus your beer is superior to your corn-syrup using competitors. 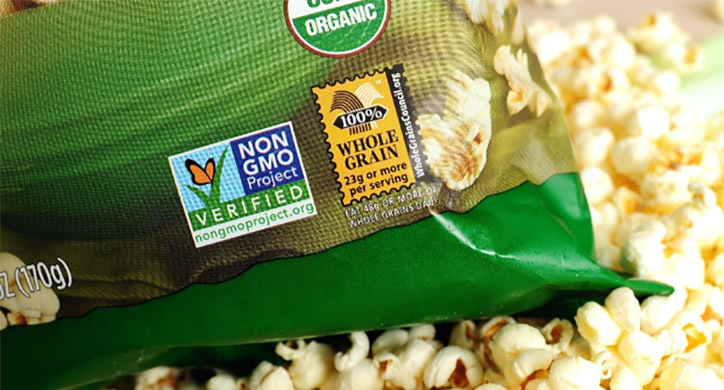 The ad vilified corn syrup and left farmers frustrated by the deceitful marketing. Consumers were led to believe that Bud Light is the healthier option. 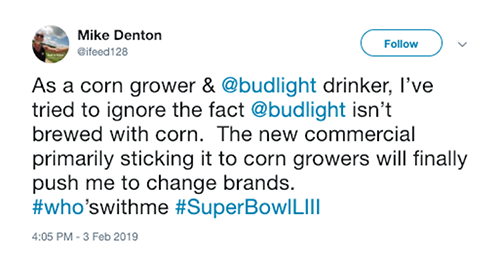 Super Bowl viewers across the country were left to question: is the beer I am drinking full of corn syrup? What’s Really Brewing in that Brew? Well, let’s rewind for a second. This is the very question that Bud Light wanted you to ask. The facts are this: all beer is made by fermenting sugars derived from starch, primarily barley, wheat, corn or rice. No matter what the source, during the fermentation process the glucose (sugar) is converted into alcohol through the use of yeast, leaving alcohol in the beer, NOT sugar. The fact that sugar is brought up at all as a differentiator between one type of beer or another is a moot point because there is virtually no sugar remaining after the fermentation process— in any type of beer! 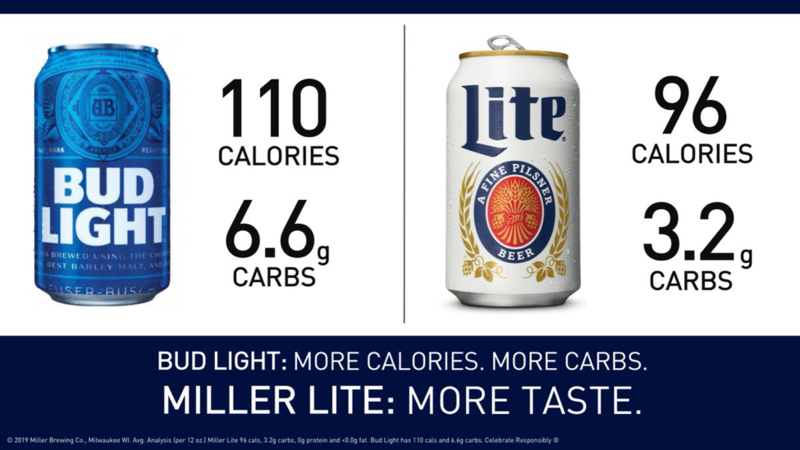 Miller Lite responded by showing calorie count and carb count as the true measure of health of one brand over the other, a better indicator of overall quality as it relates to our health. 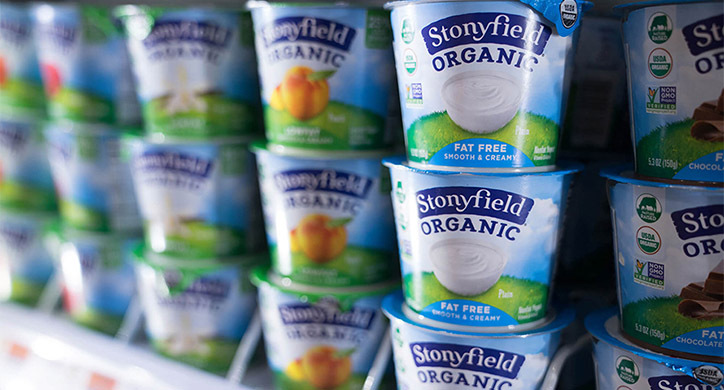 Like we saw with Juice Press, Stonyfield, and Hunt’s Ketchup, Bud Light is trying to scare consumers away from the competition for their own benefit. But at what cost? U.S. corn farmers produce the most corn globally. Key states like Iowa, Illinois, and Nebraska depend on corn farming to provide for their families and support the local and national economy. From 2016 to 2017, 1.07 billion tons of corn was harvested. 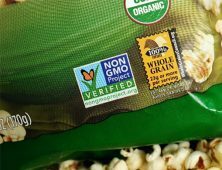 Condemning these hard-working corn farmers to push an agenda and further confuse consumer health beliefs just isn’t what we expect from a large consumer products company with home operations smack in the middle of the corn belt. Beer makers have come out to support grain farmers. 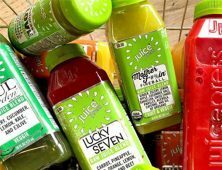 Since when is drinking alcohol healthy? 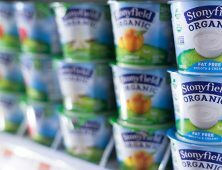 There’s an issue here that is even more simple than questioning the fermentation process or which brand is superior to another. 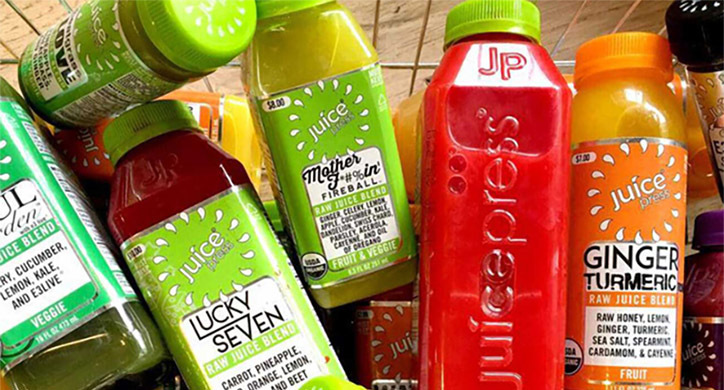 When Chris Mohr Ph.D., R.D., one of Men’s Health’s nutritional advisors was quoted about the commercial controversy, his answer was: “Rather than being concerned or arguing about the type of sweetener used to brew beer, worry about how much beer you’re drinking”. We couldn’t agree more with this perspective! 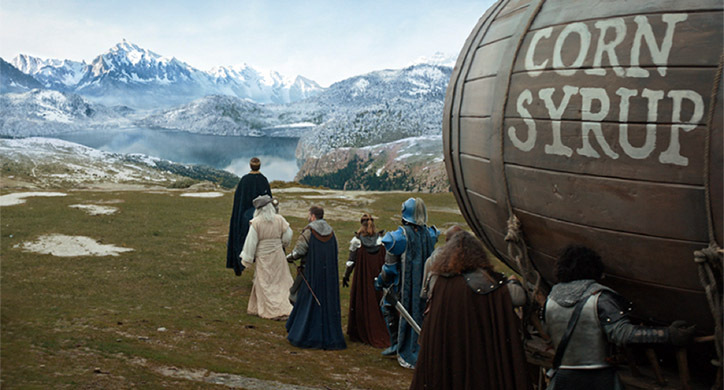 So, Bud Light, next time you want a catchy, memorable 30-second spot on the screens largest stage, how about you stick to the facts—dilly dilly? There is no residual sugar left behind in your beer. Regardless of the sugar source used in the fermentation process, what is left behind is simply alcohol, not sugar. 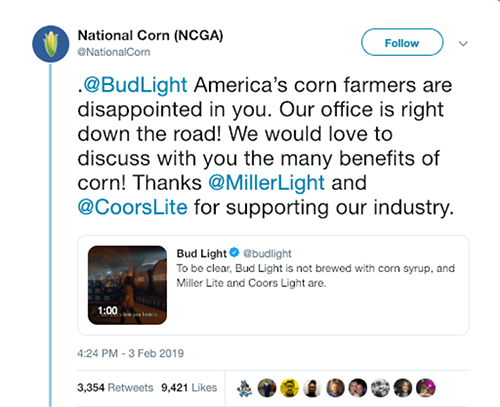 “Dilly Dilly” to Miller Lite and Coors Lite who took a stand to unveil the mistruths behind this sneaky charade. And importantly, remember to enjoy your beer responsibly, whether its fermented from corn, rice, or whatever source you think yields a more refreshing brew!